Adjustable-height tripod made of lightweight aluminum; This light weight portable travel tripod eases the burden of travelling with heavy-duty tripods. Featuring quick release, extendable, telescopic legs; this adjustable tripod is easy to set up and carry thanks to its light and compact design. 3-way pan head allows for tilt and swivel motion; portrait or landscape options; Quick-release plate helps ensure fast transitions between shots; Quick-release mounting plate helps ensure fast transitions between shots; Handle for lifting and carrying, lightweight and portable. 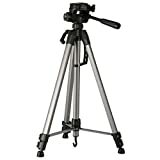 • Tripod with 360° 3-Way Panoramic Head, Universal 1/4″ Quick Release Plate, and Bubble Level, Load capacity 6.6lbs/3kg. • A nicely finished 3-way pan/tilt head with two bubble levels for precise vertical and horizontal orientation, and a quick-release plate for speedy camera mounting and removal. • The built-in level above the legs lets you know when the base is level. Another on the top of the camera plate lets you know when the camera is level. • The rubber feet adjust to help you achieve the perfect position. It has the rigidity intensity, high-efficiency shock absorption, better heat resistance and corrosion resistance. This entry was posted in Discount Photography and tagged 3Way, 66/168cm, Cameras, Canon, Capacity, Concept, Degree, Digital, Extendable, Head, LightK&F, Lightweight, Load, Nikon, Panning, Range, Sony, TL2823, Travel, Tripod, tripods by Ball Photo. Bookmark the permalink.